What a beautiful photo! I bet A. is a Daddy's Girl, isn't she? Mine certainly is! How precious is that?! So sweet! 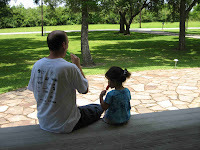 Scott and Annelise look like they are enjoying their cool snack. Looks like summer to me! Cute photo. I've enjoyed visiting your blog. Fun to find you!